In just a few days I depart for the happiest place on earth! I’m going to Walt Disney World in Orlando, Florida. 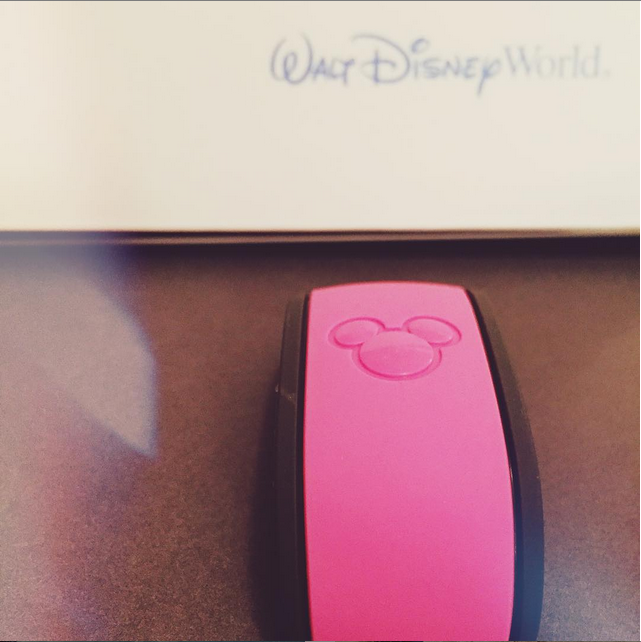 My brother booked his trip to Disney as a surprise anniversary present for his wife (and one of my best friends). They are going up early and I will meet them there. Hooray for spontaneity! I absolutely love Disney. It really is a magical place. The parks are alway gorgeous and well maintained. There’s always something new, surprising and imaginative. They have gourmet and junk foods that will satisfy all your cravings. I love the shows, characters, parades and rides.There may be long lines, crying kids and overbearing heat, but you don’t care because you’re in Disney! My favorite character and I! 1990s: My first experiences with Disney were at EuroDisney in Paris, France. As a child living in Germany my family would take regular trips to EuroDisney. I remember staying at The Old West Hotel (that’s no longer there). 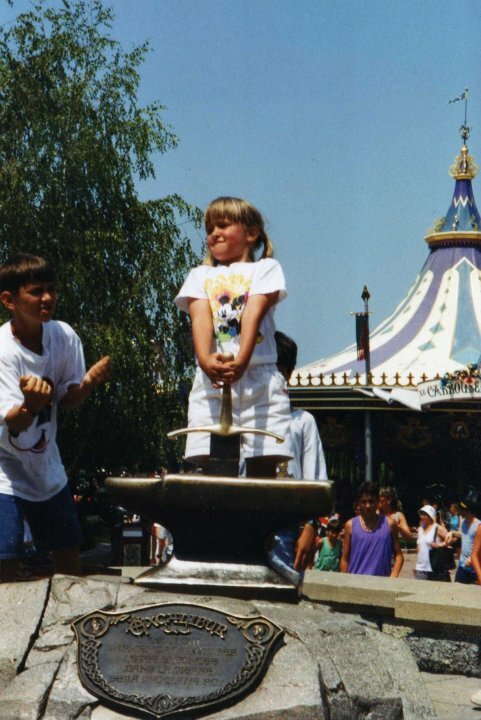 There’s a hilarious photo of 5-year-old me in Mickey ears, bawling my eyes out in front of a Native American Statue. I wish I could find that photo (there’s a recreation one below). This is where my parents discovered my love for Chip and Dale. Most children go crazy for Mickey or the Princesses. Not me. 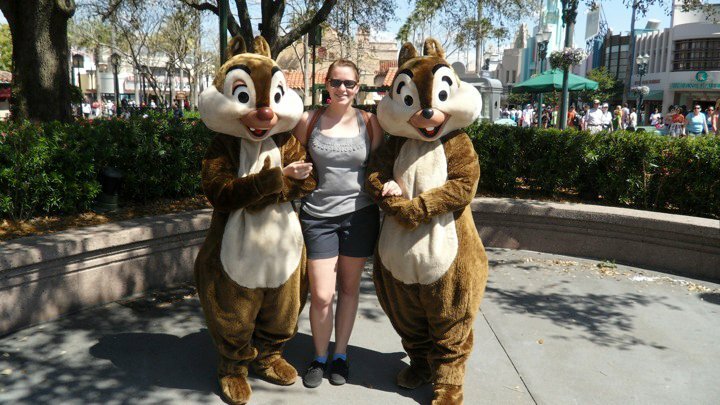 Apparently I was all about Chip and Dale! My next trip to Disney was only for a few hours. EuroDisney used to have a whole mini-park outside the park. You used to be able to walk around the themed hotel areas for free. You could see shows like Buffalo Bill’s Wild West, carol singers and more. My parents and I were visiting my brother in Germany and we took a day trip to Paris. Because my Dad is a notorious cheap skate (XOXO Daddy) we stayed outside of Paris and near Disney. It sucked to have a commute to Paris but it was great to be able to browse downtown EuroDisney. 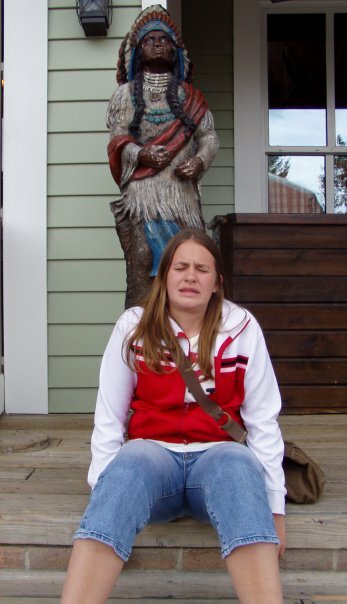 I was able to create the classic Becca crying photo in front of the Native American. 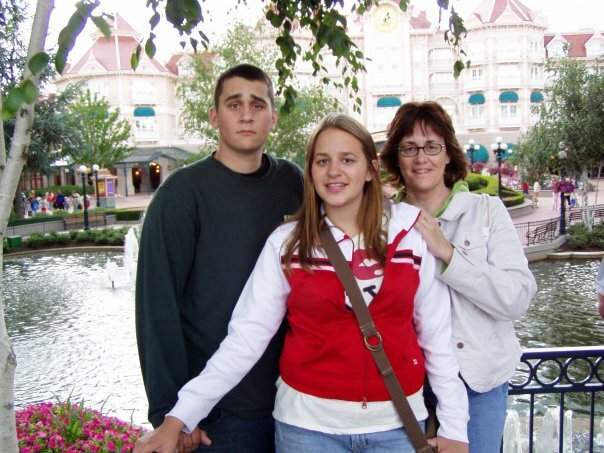 The first time I went to Disney World was Spring Break of Sophomore year. The gang (Nina, Jamie, Phil) and I went to Orlando. We stayed at Phil’s family time share and park hopped throughout Disney. We had a blast drinking at the time share, laughing at each other and being extremely obnoxious everywhere we went (as young people often do). I remember going to Magic Kingdom for the frist time and it being absolutely Magical. We had an amazing time. The weather was perfect, the lines were short and we did almost everything! We also went to Animal Kingdom, Epcot and Hollywood Studios. Animal Kingdom was my favorite. I can not wait to go back and see how the parks have changed. In 2013 I went on a trek throughout Western Europe with my friend Jenny. She and I had a blast exploring England, Ireland and France. We visited Paris last. Jenny began feeling sick toward the middle of our week in Paris. So it was surprising that she wanted to go to EuroDisney. I was up for anything so I went along. In hindsight we probably should have saved our money. Because Jenny was massively sick. I’ve already been there before. It’s just like Disney in America. Jenny was at the middle stages of some sort of head cold/flu and she was not a happy camper. So a majority of the time there was spent by me trying to cheer her up. Also Disney doesn’t have very many actual rides. Like the Disney in America it’s catered to children. So most of the rides are animatronics train or boat rides. The lines in the park were insane. So I think we only ended getting on five or six things before we left. Ultimately, I had a decent time. Jenny on the other hand had to find a French Doctor that night. This will be my first “Adult” trip to Disney. I’m going with my two best friends (my brother and my sister-n-law)! My old roommate Cortney will be there the same time. I plan to drink around the world at Epcot, ride the Toy Story ride several thousand times, and eat tons of chocolate! How I’m getting there: I cashed in my Chase Safire Rewards and got free plane tickets! Where I’m staying: Disney’s All Star Music Resort! So it’s not the ritz…but it is the cheapest hotel at Disney World and I’m on a budget! Besides I don’t think I’ll be spending that much time in my hotel room. What I’m doing: I got my MagicBand so I’m going to be riding like a VIP! Just kidding… I will have access to early openings and late stays at the park. I’m skipping the Magic Kingdom (been there, done that) and exploring Animal Kingdom, Epcot and Hollywood Studios. I am thrilled that you mentioned the Toy Story Ride! So great.